A very special once in a lifetime Gujo Odori night of dancing will be held to mark the end of the Heisei era, and to welcome Japan's new Emperor Prince Hironomiya. 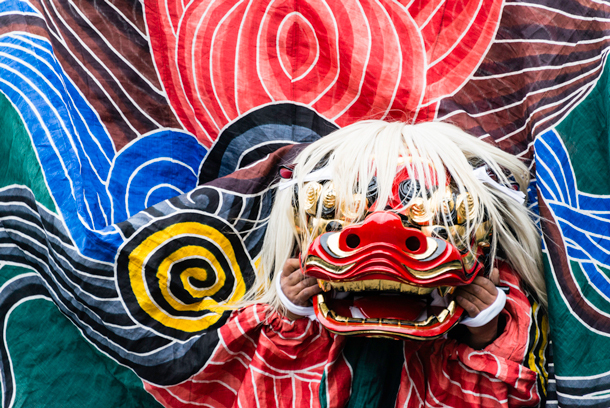 Join us on the evening of April 30th, 2019 for a parade along Ima Machi and Shin Machi that will begin at 19:00, with dancing to start at 20:00 until 02:00 the following morning when we will welcome a new era in Japan. Everyone is welcome. 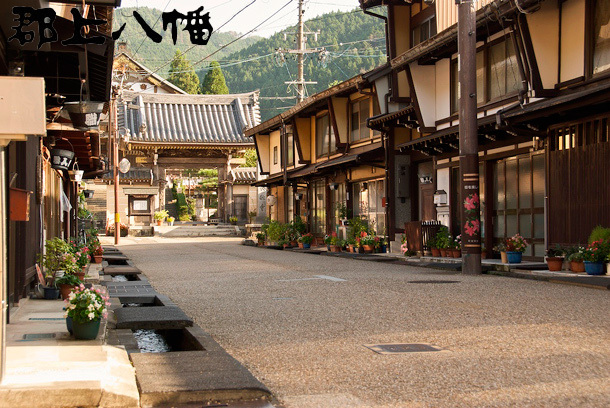 Visit Gujo Hachiman and you can expect to be immersed in an authentic small town Japanese experience unique to an "off the beaten path" town. Here the traditional way of living is on a very human scale. People passing each other in the street still greet each other with a small bow, and exchange a passing greeting. Gujo Hachiman offers visitors a rare opportunity to see, and be part of, a traditional way of life that has changed little over many years. Visitors to Gujo Hachiman may find the use of English somewhat limited, but can always expect a warm welcome wherever they may go in town. Download our free self-guided visit with detailed map in PDF format to plan your visit to Gujo Hachiman! 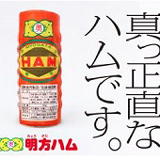 Spring in Gujo Hachiman is about renewal. With winter slowly fading away for another year, it's time to think about the delights of Spring. The prime cherry blossom viewing time, in early April, is typically a week later than in Nagoya, but check the daily cherry Blossom Forecast on TV to find the peak days. 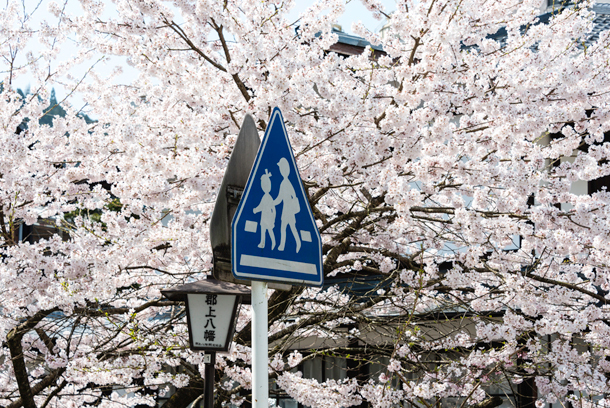 Use the map below to locate the best cherry blossom viewing places around town. 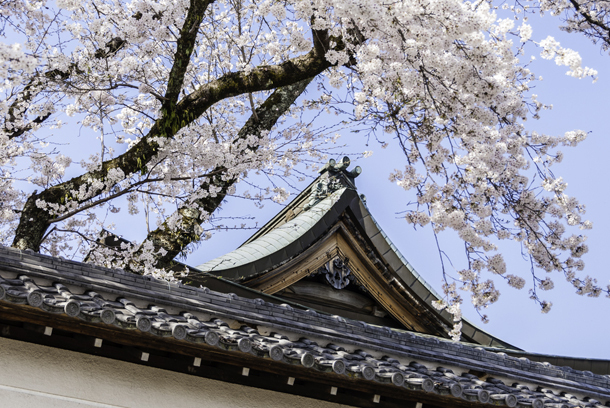 You'll find cherry blossom viewing to be much more relaxed compared with larger urban areas, and all the places listed on this map are within easy walking distance of each other so you can easily visit all these sights in one day! 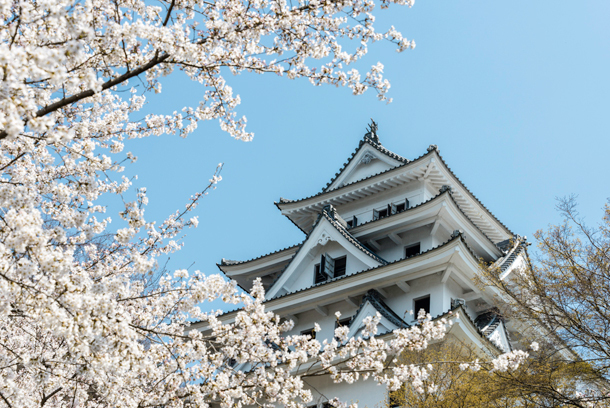 Some of the parks listed on the map provide excellent hanami places to bring a bento box lunch and sit under the cherry blossoms for an unforgettable and truly Japanese experience. Atago Park, near City Hall and the City Library is an especially lovely place to spend some quite time with the cherry blossoms. Nature puts on a spectacular show for everyone to enjoy throughout the town. This festival runs for the entire week-end and is very popular with local photographers. Plan to stay over the night before so as not to miss the parade which begins early each morning. Participate in a unique and accessible Japanese cultural event in a way few foreigners ever get to experience. 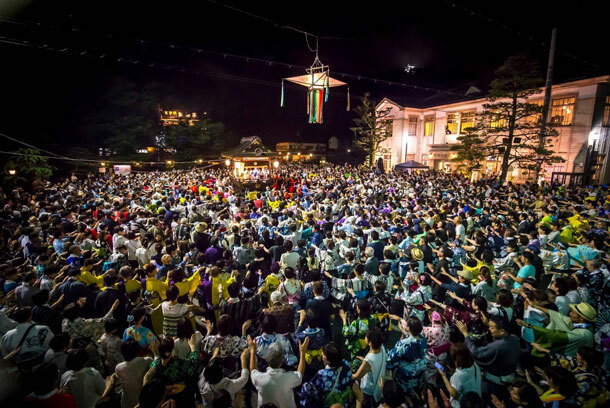 Dance all night to traditional odori songs like "Kawasaki", "Harukoma" or "Gengen Bala Bala." 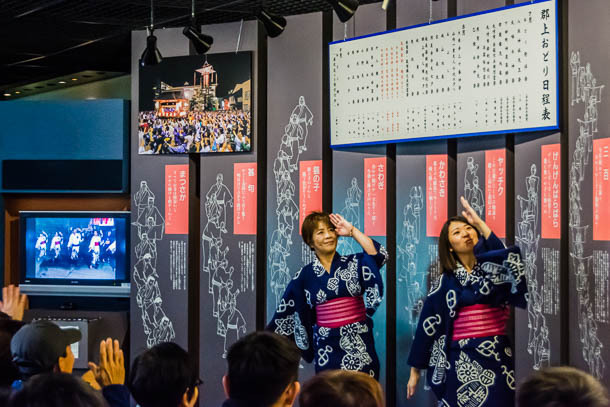 Dance lessons are available daily at the Gujo Hachiman Kinenkan Tourist Centre at 11:00 am 1:00 pm, 2:00 pm, and 3:00 pm. during Gujo Odori season. 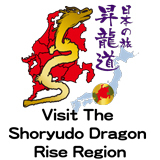 You can learn more about Gujo Odori here and find the start time and location of each day's dancing here. Enjoy a truly authentic traditional ryokan or minshuku experience at any of the many ryokans or minshukus listed on the accommodation page. All these ryokans or minshukus are small, intimate, and family run. 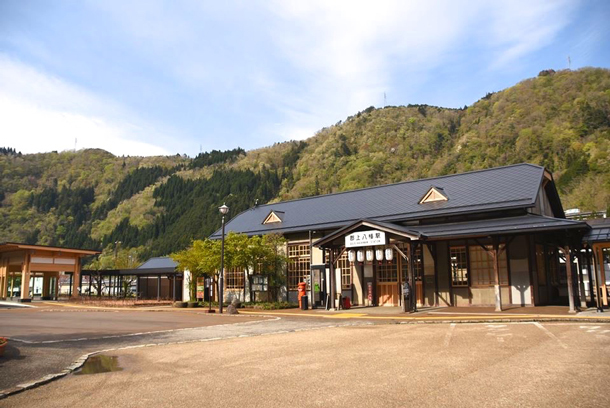 The Gujo Hachiman Kinenkan Tourist Centre can help you find the one that's right for you. 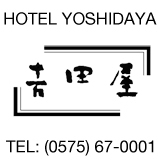 Please note that accommodation during the Gujo Odori season is best booked well in advance. Learn more about surprisingly affordable ryokan and minshuku accommodation in Gujo Hachiman. 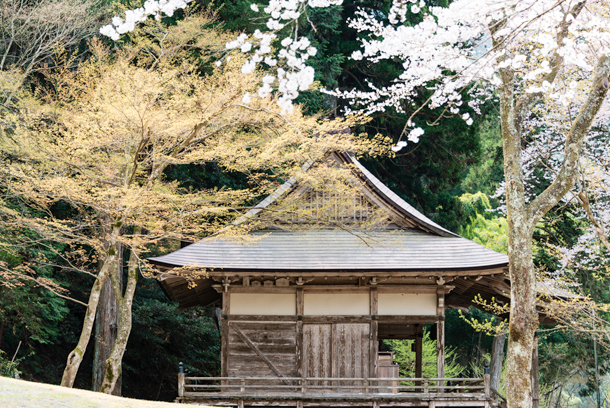 The Japanese garden at this small temple is simply magnificent. But more importantly, it is peaceful, soul restoring, and uncrowded. 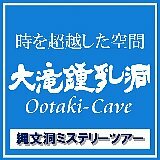 Be sure to listen for the "suikinkutsu" or "water harp cave". While the autumn colours are stunning, the other seasons also have their charms. 4. 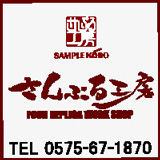 Plastic Food Replica Stores and Workshops - anytime and unique to Gujo Hachiman! For a truly unique experience, wade into the Nagara River and try your luck at catching your dinner! (A permit is required but easily obtained!) For the less adventurous, be sure to try this gourmet treat in restaurants around town! A local can point you in the right direction. A ride on the Nagara River Railway is a trip back in time to when travel was exciting but relaxing, and the views from trains were unmatched. 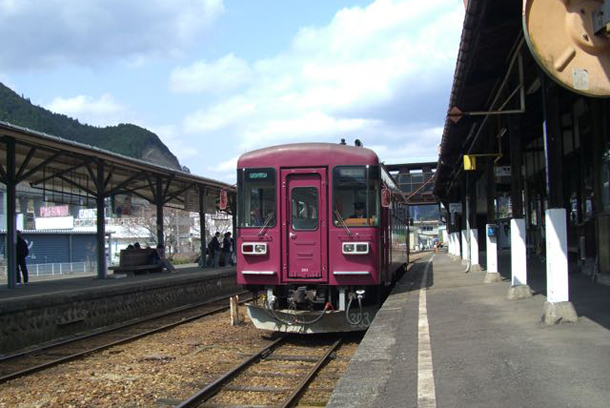 The small "one man car" trains of the Nagara River Railway offer practical, relaxing, and hassle free transportation for visitors seeking to reach Gujo Hachiman from Mino Ota. And starting April 2016, the week-end only specially designed all first class "Nagara" offers a unique "not to be missed" rail experience daily between Mino Ota and Gujo Hachiman. Learn more about this unique rail service. 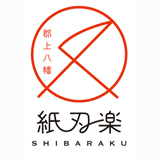 This convenient pick-up service is timed to connect with the highway bus services offered by Kintetsu, Meitetsu and Nohi Bus companies. Gujo Hachiman is an intermediate stop on highway bus lines that serve Hida Takayama making it easy for visitors to stop off in Gujo Hachiman on the way to or from Hida Takayama. The highway bus stop is located out of the centre of town 2km from the town centre as shown in the map above. 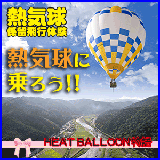 Advance reservations are required BEFORE your highway bus departure from Nagoya, Takayama or Osaka. Fee : 350 yen Reservation : 0575 67 0002 (9:00am~5:00pm ) pick-up bus service time table. The Japanese National Government, in 2013, designated 14.1 hectares in the centre of the central historic district as an "Important Preservation District for Groups of Historic Buildings." Specifically the buildings along Ote machi, Shokunin machi, Yanagi machi and Kajia machi. Visitors can easily find, and visit this historic area which surrounds the central Jokamachi Plaza. Download our free self-guided Historical Visit tour and map. 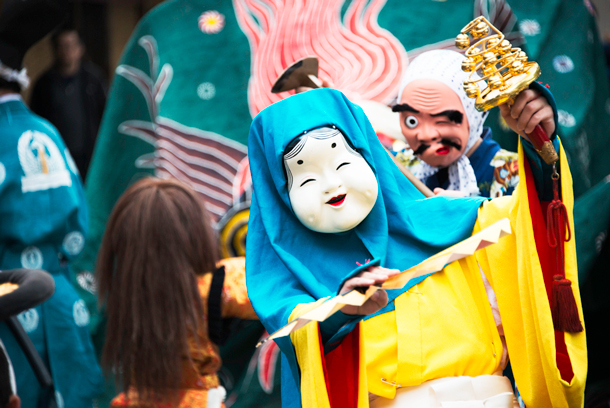 Visitors can easily visit all the key sights and places in Gujo Hachiman on foot in one day. Overnight visitors may especially appreciate the calmness of the town in early evening and morning. Download our Free City Map and start planing your visit! You can also take a free self-guided tour. Download the free map and walking tour directions. Allow about 2 hours for the full visit which includes the historical centre of town. A self guided river walk tour is also available for free download. 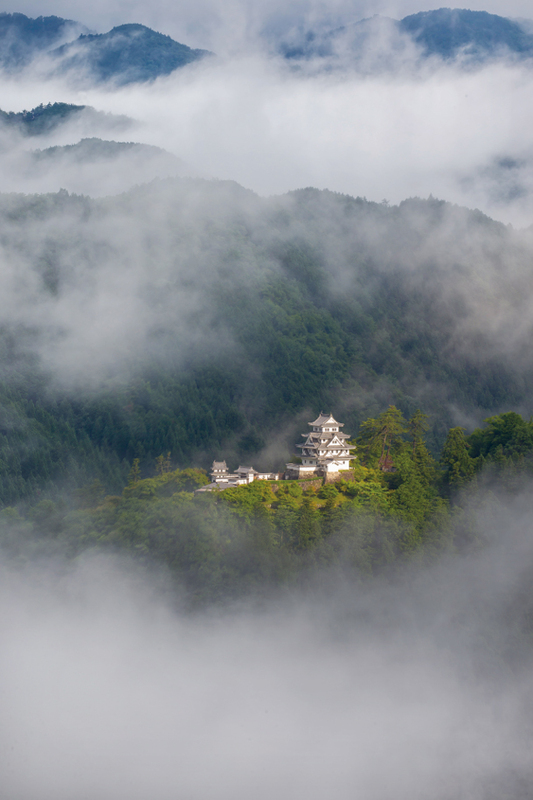 It's the perfect way to experience Gujo Hachiman in the Spring and Autumn. Everyone is welcome to learn Gujo Odori. The Gujo Hachiman Hakurankan hosts daily Gujo Odori lessons in the two most important dances - Kawasaki and Haru Koma. The pace is relaxed, entertaining and easy to follow. Those wishing to simply observe are also welcome. When:　Daily at 11 am, 1 p.m., 2 p.m. and 3 p.m. 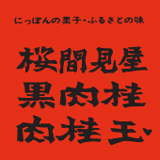 Lessons are in Japanese and English. Everyone is welcome and it's not difficult to join in.